A copy of Makansutra in hand (thanks, Max! ), I've spent the past week eating my way around Singapore, mostly in hawker centres and food courts. What a city for food! The dishes below are some of the best I've eaten. Forgive the iPhone photography, please, and also the lazy year or so since either of us posted on this blog. 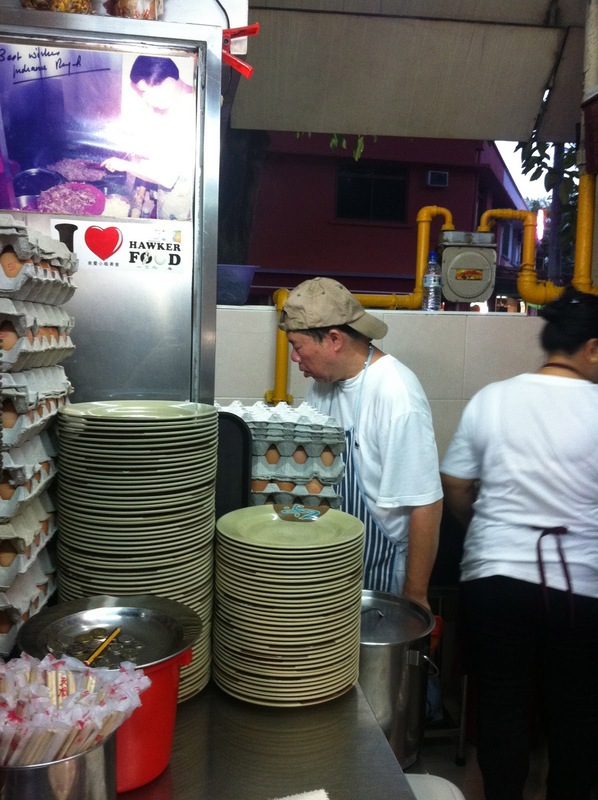 A bit baffled by the hawker centre at first, I stumbled over my words as I ordered. The helpful old lady manning the counter tried to help me out: "you want stomach, or no stomach?" I wussed out and chose the "beef only" option, which ended up bearing a striking, if superficial, resemblance to pho tai. In fact, I had a Singaporean explain to me that she'd had great beef kway teow soup in Melbourne, but I'm pretty sure she was describing Mekong on Swanston St. The broth is light, without the deep beefiness of pho. 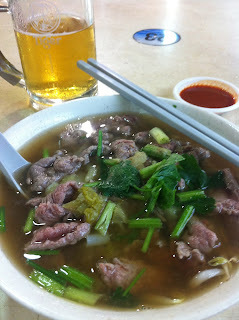 This is exactly the sort of thing you want to eat in the Singapore heat, where it feels as if you're drinking the air: a light, refreshing, soup, all celery and basil and beef. A big bowlful was $SG 4. Somewhat confusingly, No. 18 FKT is now located at stall #17, but it doesn't appear that anything has been lost in the move of a few metres. This place has quite the soup nazi vibe, with an old man hunched over his wok, intensely concentrating on each batch of noodles as he fries it, barely acknowledging the orders as they're passed to him. You have three choices: small, medium or large noodles, for $3, $4 or $5 respectively. A few people in front of people got theirs to take away, wrapped up in a piece of paper and whisked away to elsewhere. Why people eat KFC in this city, I will never understand. The 'dude food' descriptor is a bit obnoxious, really, but if anything fits the bill it's this. 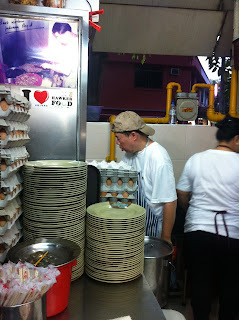 A gutsy mound of fried noodles, heaving with slivers of lap cheong and briny, sweet cockles, the noodles seared so precisely that you'd swear he'd cooked them separately, doting on each strand like an adoring dad. Devouring this with my good friend, a mug of Tiger, sitting next to the river in the open air, left me in the sort of euphoric revery that is usually only sparked by tasting menus at thirty times this price. A real meal to remember. I walked nearly every aisle of the food centre looking for Tian Tian, but I needn't have bothered squinting at the signage: it's easily identified by the queue that snakes around the double-fronted hawker's hut, around the back of the centre and out into the open air. Locals gladly queue for half an hour or more for their plate of chicken and rice. I had to try Tian Tian, given Bourdain's raves and the three chopstick rating from Makansutra ("die, die, must try! 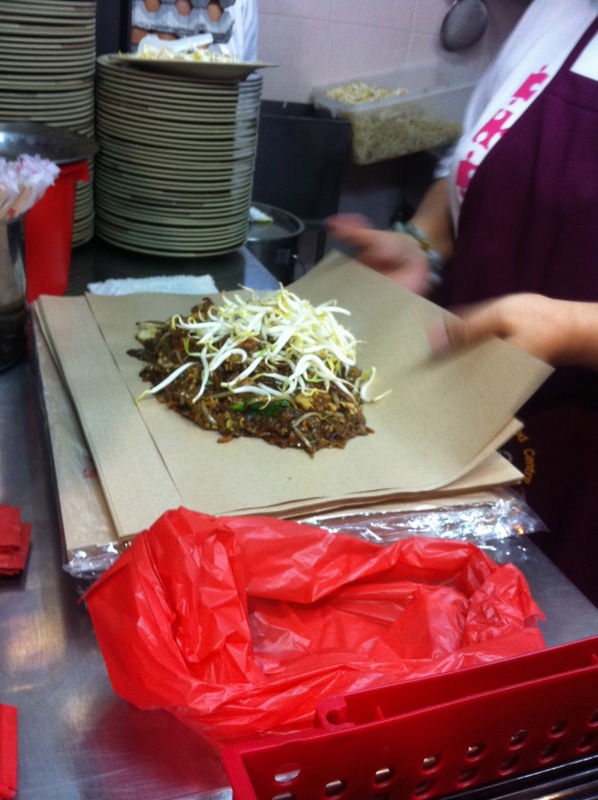 "), but I must admit I was less excited about this than some of the other dishes on my extended SIngapore menu. While I've had good chicken rice in the past, I had never quite understood why people hold this simple dish so close to their hearts. Now I'm a believer. I stood there queuing in the midday heat, sweating like the sunburnt Pom I almost am, genes more suited to Manchester and jeans to Melbourne, unsure of what to expect. I'm still not sure I'm able to discern the subtle qualities that distinguish a great chicken rice from the merely good, though the quality of the sauces has been quite variable at the few places I've tried here. Perhaps it's a bit like a poached egg: it's easy to tell bad from good, but to separate the great from the good requires the sort of studious devotion to a single dish that those of us with a more varied diet struggle to attain. Nevertheless, Tian Tian's reputation is clearly well deserved: the chicken has that gelatinous wobble, the rice that mysterious, fragrant depth of flavour and the sauces are fresh and pungent. I just might have to eat chicken rice more often so I know how good Tian Tian truly is. At first I wasn't sure what to make of this place, up on the sixth floor of a shopping centre/hotel complex… I was expecting to emerge from the lift to see a food court, an air-conditioned equivalent of the hawkers centres, with a big queue snaking around to the chilli crab place. Instead, a couple of chinese symbols that I guessed meant "Dragon Phoenix" were all I could see. It was an actual restaurant, with tables and a roof and the whole extravagant production. Something different! The hosts looked like they didn't know what to make of me either, a lone, youngish white guy wandering in with my Uniqlo shopping bags and a confused look on my face. They sat me near the only other two gweilo in the place, a disgruntled looking pair in their 50s, who sat silently seething at each other through their brief and perfunctory meal. I was expecting the sort of abrupt indifference that often characterises the service in Chinese restaurants, but the hosts bent over backwards to be friendly and explain things. I ordered a whole chilli crab and some steamed peanuts and chilli sauce to start, and I was reunited with my old companion, a mug of Tiger. Chilli crab is not a dainty dish. It is not a delicate dish. It's a brute force, all hands on deck, sauce and shell flying everywhere, messy hands, messy face sort of a dish. I got up a rhythm that became compulsive, cracking the claws, gouging out that sweet flesh into the sour-spicy broth, scooping up the larger morsels with my chopsticks, soaking up as much as I could with a fried bun, rinse, repeat. It's an involved ritual but it's very much worth the hassle. Eventually I got talking to one of the old men who seemed to run the place, he seemed genuinely happy that I enjoyed the crab and didn't find it too spicy. I wandered back to my hotel, along the river, wondering why I'd never been to Singapore before. Well I had a plastic cup of VB GOLD and a box of Food2Go chips for dinner. MCGalicious. i literally applauded when i saw that you had a new post. 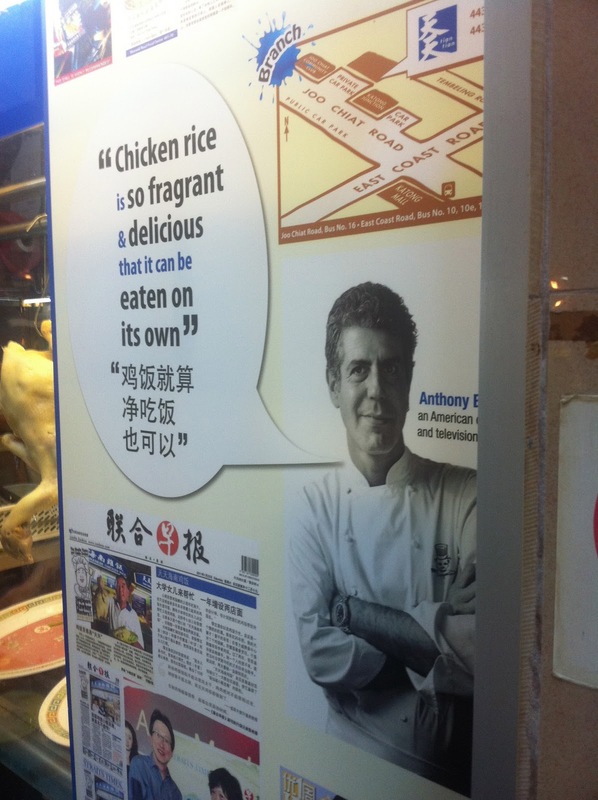 oh man, i really have to go to singapore - if only to eat that chicken rice! awesome post, matt! I haven't been to Singapore before but will be making a brief two hour stopover on my way to Bangkok tomorrow. I hope the food at Singapore Changi Airport is good. I guess chicken rice to Malaysians/Sinagporeans is what Pho is to Vietnamese people. Total comfort food that is delicious. I will also doing the Bourdain thing when I travel around Vietnam and try to find the best banh mi that he had in Hoi An.